Friday night, D and I went on a double date with our best couple friend, The O Family. We had a great time seeing The Avengers together. D and I had our traditional Friday night pizza with the kids but Mr. & Mrs O decided to really make it a big date by going to IHOP. Mrs. O wanted Nutella Crepes. but for some reason IHOP was out of crepes. I'm not exactly sure how a pancake house runs out of crepe mix without running out of pancake mix, but whatever. It got me thinking...first about Nutella. And then, about how easy it would be to make Nutella Crepes at home. My fridge was not well stocked and I was out of milk. But, I did have plenty of Krusteaz pancake mix...just add water. Some people think the only difference between crepes and pancakes is that crepes are thinner. That's only partially true. The reason they are thinner is the big difference. It's not more liquid; it's the lack of a leavening agent like baking powder. I know you didn't come here for me to go all Alton Brown Good Eats on you, so I'll save the lecture on proper crepes...and instead focus on how to do it the lazy American way by using pancake mix. In a large bowl, add pancake mix and water according to the package. Beat in the egg. Now, for the scientific part: Add in enough additional water to make the pancake mix very runny. Like soupy runny. Pour a ladle full of batter on to the griddle. Tilt the griddle from side to side to encourage the batter to spread out, making it even more thin. After its cooked on one side, flip it to the other. Once you've removed the cooked crepe from the pan, fill it with Nutella. As much or as little as you'd like. Then add bananas, strawberries and other assorted fruity goodness, enough to mask any guilt you may be having eating this for breakfast. Roll the crepe and top with more fruit (more fruit = less guilt) and Cool Whip. I love crepes. Thanks for sharing! I am excited to try these! Thanks! Super easy and with Nutella too. How fun! Can't wait to get my hands on some of these! Now following through FB. Love from Whimsically Homemade. Yum! These sound delicious! Thanks so much for linking up to Creative Thursday this week. I can’t wait to see what you link up next week. Have a great weekend. 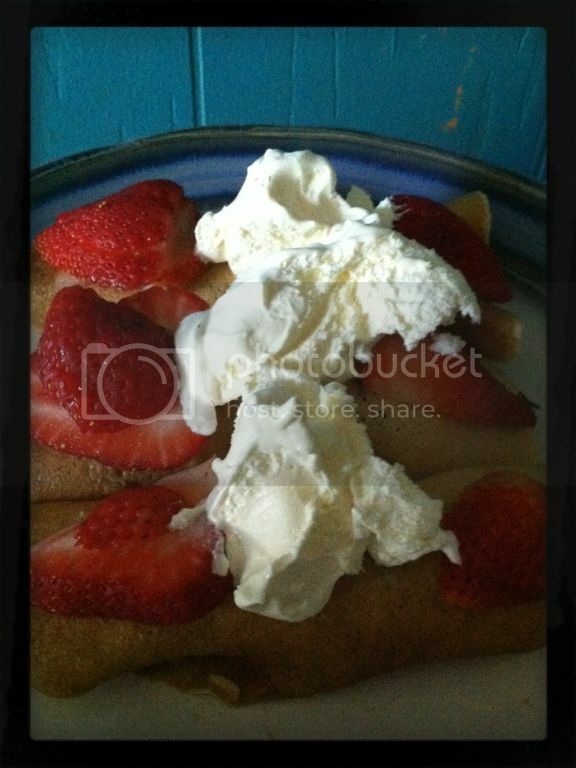 The crepes look fabulous! I am addicted to Nutella so you can bet I will be making these. Thanks for sharing at the Open House party.